This may be a bit of rock and roll blasphemy, but in all my time as a rock and metal fan I've never seen KISS perform in concert. One of their shows has been on my concert bucket list for a long while, and the band's Freedom To Rock tour finally brought about my chance to cross this one off my list. On this current trek across the US, KISS has been saluting US veterans for their service and sacrifice and that continued on this night. 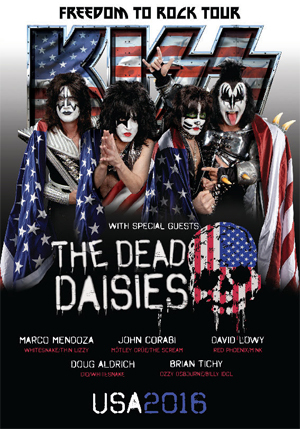 But first, we need to talk about THE DEAD DAISIES! The band featuring John Corabi, Doug Aldrich, Marco Mendoza, Brian Tichy and David Lowy released their Make Some Noise album a couple weeks back and they've been supporting it on this tour. I've been a fan of theirs since the first album and I was very keyed up to see them live. My expectations were met and surpassed. From the time they hit the stage for their version of "Midnight Moses", THE DEAD DAISIES had a fantastic grip on the stage. They won over the slavishly devoted KISS fan base with an electrifying performance that saw them touch on material across each of their releases. John Corabi was a whirling dervish on vocals, while Marco Mendoza whipped the crowd up into a frenzy. Tichy pounded the drums like a madman and seeing Doug Aldrich play live made my day. I was a little surprised that in a 10 song set (which they started well before the scheduled 8pm time listed on the tickets) the band had four covers but they did such a great job making the songs their own (even streaming "Join Together" from THE WHO live on Facebook), it didn't feel like they were covers. I know a lot of people don't pay the openers much attention, particularly at a show where the headliner is a force unto itself, but for me watching THE DEAD DAISIES in action got me screaming my support at the top of my lungs. The set list was fantastic and hearing them perform certain songs enlivened my enthusisam for those tracks even more. "Long Way To Go" and "The Last Time I Saw The Sun" were probably my favorite songs on the night. Before the show a friend of mine told me that the band had done a signing after their set at another stop on the tour. I wasn't sure if they'd do one in Worcester but as my brother and I walked in to the venue, there was a sign announcing the meet and greet for right after their set. Sure enough, right after their last song, we made a beeline to the signing table and after a bit of waiting, I got to briefly talk with John Corabi about how much I liked the track "Song and A Prayer" (got a nice photo with him as well) and Brian Tichy as well as having everyone sign my copy of their latest album. "The Last Time I Saw The Sun"
After all that, we were still back in our seats in plenty of time for the main event because after all, we wanted the best and we got the best...as the curtain dropped and suddenly my brother and I could finally say that we saw KISS in concert! And the spectacle of a KISS concert was definitely to be had on this night. All the bells and whistles, with the accompanying booms, bangs and flames made the simple act of seeing a true rock and roll SHOW well worth the rather extended wait. Opening with probably one of the best concert opening numbers from any group, "Detroit Rock City", those slavishly devoted fans that I mentioned previously, lapped it all up with gusto. And I was right there with them. There is a lot of truth in what Paul Stanley said from the stage during the latter part of the show when he talked about people seeing the band for the first time never forgetting their first "KISS". There's been talk about various issues cropping up with the band's performances (Paul's voice in particular). And while there might be some truth to it, there can be no doubt that the band really knows how to work the crowd. Behind their characters, Paul Stanley exhorts the crowd and whips them into a frenzy, Tommy slays them with his playing, Eric (despite the fact I still think of him as the drummer for BADLANDS) pounds the skins and reminds everyone how special "Beth" is. And then there's The Demon himself, Gene Simmons. I don't know why but the blood and fire breathing that could seem so cheesy after 4 decades still seems to bring about a momentary sense of dread as things are happening. I also never really realized just how much lead singing he does on songs during the show. Rookie mistake on my part. From performing high above the stage ("God Of Thunder") or ziplining to the back of the arena to perform on a mini stage ("Love Gun" and "Black Diamond"), the energy level of the show never flagged and KISS worked every possible inch of the stage. I mentioned how the band was saluting veterans on this tour, and before the show some veterans made their way on the show floor and received a standing ovation. That was repeated late in the show when the band brought more veterans on stage before leading the crowd in the Pledge of Allegiance followed by the playing of the Star Spangled Banner. It does give one goosebumps to hear that many people speaking in unison. The chosen set list was heavy on the classic hits which isn't surprising though the nitpicker in me would've liked to have heard them play "Crazy Nights" which is one of my favorite KISS songs. However, from start to finish the songs inflamed everyone's passions for the material and kept most everyone on their feet throughout. I really enjoyed hearing "I Love It Loud", "Shout It Out Loud" and "Lick It Up""Flaming Youth" too. It's not a song I'd really given much thought to over the years, but it was pretty good and it is also one of my brother's favorite KISS songs. When the band closed things out by spewing confetti throughout the arena as they ran through "Rock and Roll All Nite", a crescendo was reached and concertgoers were able to stream out into the night highly satisifed that they'd just seen a great show. This might sound like I'm gushing but I really did like this show. It was made more special because I got to share it with my brother who is a huge fan of the band and had never seen them live before either. KISS knows how to entertain the masses with spectacle beyond measure. And that's what I was...highly entertained and overjoyed to have seen this show. Freedom to Rock? KISS gets a "Hell Yeah" from me on that score! Bass Solo / "God Of Thunder"